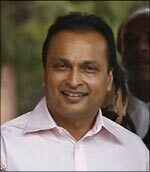 Reliance ADA Group chairman Anil Ambani has been allowed to meet two senior executives of his parent company now lodged in Tihar prison who were arrested in connection with 2G scam case. "We have granted permission to Anil Ambani to meet two of his Reliance executives now lodged in our prison. He will meet them after sunset," Neeraj Kumar, DG Tihar Prisons, said. Ambani is expected to meet Gautam Doshi and Hari Nair who work for his parent company, the Anil Dhirubhai Ambani Group. Three top officials of Reliance ADA Group Gautam Doshi (the company's Managing Director), Surendra Pipara and Hari Nair have been accused of conspiracy and abetment of cheating in 2G spectrum allocation scam. "Gautam Doshi and Hari Nair who are lodged in Jail no. 3 have been allowed to meet Anil Ambani. Surendra Pipara is in AIIMS," he said. The three top officials of Reliance ADA Group have already completed 55 days of stay in the Tihar prison since April 20 after a special CBI court rejected their bail plea in the scam.